There’s a house that stands witness to its own history. Werner’s sonic evocations beseech us to absorb appalling absences in this most haunted territory. 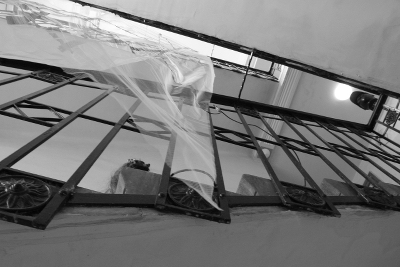 We don’t always know, definitively, what’s happening in Werner’s mysterious spirit choruses: an aerial antenna floats down a stairwell; known and unfamiliar languages stutter over time. I found I could claim the hallways and stairs in the building as a sort of home. So in a way I was still outside but on the inside, too. The house in Vienna survived the war where it’s since been inhabited by people who knew little of its history. Or, rather, they’ve only begun to learn its scope. Stories come alive through Werner’s ornate sound ‘staging.’ The American radio artist began visiting her relative’s Viennese neighborhood in the last decade, traveling there with her aging parents. On her own, via artist residencies, she’s developing Strange Radio, which began airing in 2016. Two episodes comprise Haus. Read the conversation with Earlid’s curator as Werner details her own relationship with the idea of home and ghosts, a caretaker of the stories within. Werner says the feeding of someone who is wounded is a way of feeding herself.